THE FOLLOWING INSTRUCTIONS APPLY ONLY TO SMARTWITNESS VEHICLE CAMERAS! SmartWitness is a unique camera integration. While having an offline SD card, key events and live views can be pulled directly off of the camera and sent into the GPS platform – all over the air and in real time! There are three ways to pull camera feed to view on it on your GPS site. Nonetheless, all three methods land in the REPORTS/Camera Events section. When manually pulling footage, Camera 1 is front facing and Camera 2 is cab/driver facing. The images are pulled in series, and the video clips can be up to 20 seconds long. The camera reports its GPS tracking data every 15 seconds when the engine is on. 1. The following events are recorded automatically, without having to set a Camera Rule: Acceleration, Deceleration, Impact Detected and Panic Button all automatically backup still images to our servers. For video recording, a Camera Rule will have to be set. Still and video imagery can be recorded for other events as well, however for this to happen Camera Rules must be set. See more here. These are more sensitive than CalAmp GPS tracking devices, so events such as Acceleration/Deceleration do not necessarily correlate with the tracking device. 2. The camera has an SD card that rolls over to video. For specific details on storage capacity please visit the Hardware page. So if the camera is online, you can go to a readings report and pull the camera footage by clicking the camera symbol in the pop-up. This will send the footage into the “Camera Events” report AND the Media Tab. 3. For an on-demand camera view, you can click the camera symbol in the pop-up from the Locations tab. This show still images from the camera, updating approximately every 5 seconds. The camera must be online to pull on-demand footage meaning the vehicle engine must be running. This Live view can disable if necessary by contacting our Support Team. While some customers may combine the SW camera with a CalAmp tracking device for a better tracking experience, the SW camera can provide tracking on its own. It does not report when the vehicle is off and generally goes offline during that time so that even historical footage is not available to pull at that time. When the vehicle is on, it reports about every 15 seconds. Because of this, most of our standard reports are compatible with it. Trips, Stops, and even Mileage (with some skew). We have linked the Panic button on the SmartWitness camera to the “Emergency Contacts” section on a customer’s account. You can set up as many of these contacts as needed to receive the alerts via Email or Text or both. 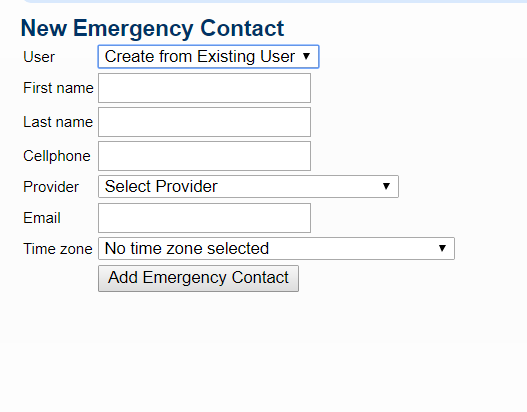 To create your Emergency Contacts go to Settings>Emergency Contacts>New Emergency Contact. If the Panic Button is triggered, these are the contacts that will receive the notification. On the CP4 Camera the Panic Button is a separate piece that plugs into the camera (see installation instructions for details). The button itself can then be mounted with enclosed 3M adhesive within the vehicle cab. In the case a customer wants the full-featured tracking through the CalAmp device combined with the SW Camera integration, we have the option to associate the two unique devices together and display them as one unit on your GPS site. You do this similarly to assigning Drivers to a vehicle. You go to Settings/Dash Cams and “install” a select camera using the dropdown list of CalAmp devices. Once the ‘install’ is done, your camera and GPS tracker will no longer appear as separate devices on the platform. For example, 3 cameras and 3 GPS trackers (6 pieces of hardware) will only appear as 3 devices on the software.